This style of uniform was worn from 1919 to 1928. This is the second style of uniform for Girl Scouts. The very first uniform was dark blue and was used from 1912 to 1919. In 1919, the girls decided that khaki was better suited for hiking and camping. Girls had a choice of a coat dress (shown here) or a shorter coat that was worn with bloomers or a skirt. Proficiency badges were worn on the sleeve. This uniform would also have had a neckerchief. Colors of the neckerchief varied. 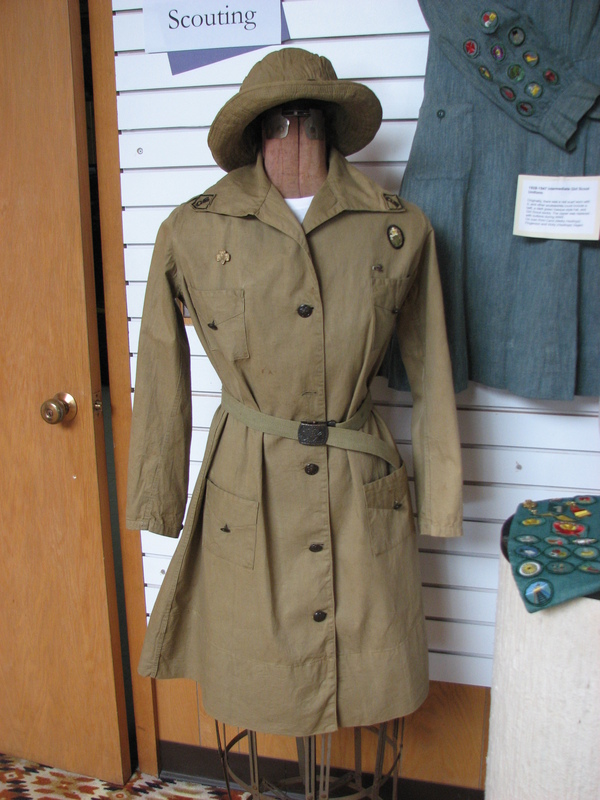 This Girl Scout uniform originally belonged to Edna Grove when she was a Girl Scout in the Twin Cities area. As an adult, she was a long time Girl Scout leader in the Glenwood area. The uniform is part of the Pope County Historical Society Collection. This entry was posted in Collection Notes, Museum updates and tagged Edna Grove, Girl Scout, Girl Scout Uniforms, Glenwood Girl Scouts, Pope County Museum. Bookmark the permalink.